I have a weakness for beauty. A well-made piece of clothing, a stylish shoe, a stunning skein of handpainted yarn. My wardrobe - and my stash - did not end up the size they are on accident. This goes doubly for food. I'm sure you're not surprised- do a search on Flickr for food, and you'll find enough glamour shots of food to make the most moderate eaters feel like gluttons. Check a foodie blog and you'll be drooling and gaining weight just *looking* at all the goodies. This last week, everything I bought at the farmer's market was beautiful. 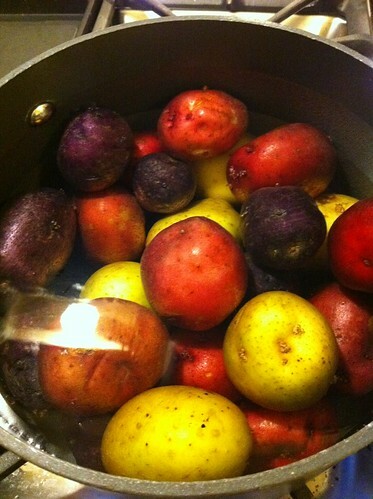 Slender asparagus, perfectly round and cheerfully colored turnips, and multicolored potatoes. I didn't have an idea of what I would use them for, but I HAD to have them. The gal in the booth thought I had LOST MY MIND. They were perfect and tiny - fitting comfortably in the palm of my hand, and SO beautiful. This picture doesn't do them justice, but my enthusiasm wouldn't allow me to photograph them one second earlier. Speaking of beauty, I should introduce you to the newest man appliance in my life, Richard Blaze. But first you need to know what happened with Luke. For those of you who were Luke fans, here's what happened. Luke was ailing. His temperature sensor had gone, and his timer was going. It was time. We called our home warranty folks to see if he could be fixed, but he was so old. They suggested we send Luke to go live on a farm. A farm where old ovens can live out their days burning food without fear of reprisal. It was really what was best, hard as it may have been. So, at the suggestion of the contractor, we made a pilgrimage to Airport Appliance, and lo and behold, there was the range and oven I have been waiting for my whole life. It was love at first sight. We saw each other across a crowded room, and that was that. It was meant to be. He is named for my favorite Top Chef, Richard Blais [WARNING, noisy site]. In fact, the finale is tonight, and I'm rooting for Richard. Permit me to wax poetic for a moment. I LOVE when people are good sports on shows that are effectively creative competition. Richard (the namesake) is affectionately referred to as "The Professor" or "Professor Blais" in the Top Chef kitchen, mostly because he's willing to help out his competitors when they need it. This means that everyone is competing at the top of their game, and that's more interesting for everyone. But back to *my* Blaze. He's a dual-fuel range and oven, and I love him. We have spent a lot of time getting to know one another. I read his manual and he delivers on all his promises, Itellyouwhut. Now, for the next frontier in earning my kitchen savvy merit badge: molecular gastronomy! I wouldn't call it a weakness, I'd call it a deep appreciation. And lemme tell you, I *deeply appreciate* anything as good as that range. Mmmm, cupcakes. GAAAAR!!!!! Marcel was an abhorrant misuse of 40 minutes of my time. I wanted to reach into the TV and slap him repeatedly. Repeatedly. Git. I would go crazy for those potatoes, too. Cute and colorful? How can you resist? I don't think I've actually ever eaten a purple potato, though. I assume they taste the same as any other potato. I am now getting all sorts of ideas for how to deal with my picky eater (I wonder if unusually colored foot is more appealing?). I would love that range too. 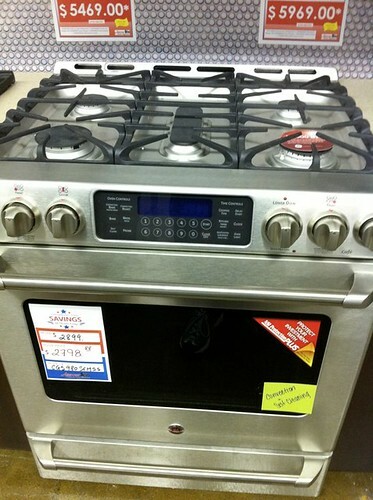 I am total electric though so when mine died I got a nice ceramic top with a convection oven. I feel your love. As for the potatoes, I am a fan. I am very carb friendly and it takes a lot to keep me away from them.